The Mens Strathcona Pro Pants from Vaude, are trekking trousers that are useful all year round. The Strathcona Pro Pants are just those kind of trousers: strong and warm enough for year round hikes and treks, but breathable enough to be worn in milder climates. With waterproof zones at the seat, knees and cuffs you'll stay drier when you stop to rest or when you make your way through brush and bramble. 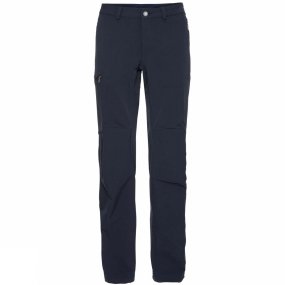 The larger part of the trousers is made of extremely stretchy Windproof Softshell that offers 80% windproof protection. This maintains a comfortable, cooling breath of microclimate permeability, helping to attain unbeatable levels of breathability. The softshell trousers keep off a fine rain for a while, and then dry quickly if they do get wet. This product is made with Eco Finish, an environmentally friendly water-repellent finish without fluorocarbons (PFC). Green Shape is your Vaude guarantee for environmentally friendly products - made from sustainable materials, with resource-saving manufacturing and in fair production facilities.